October 2013, and terrifying, devastating fires in the Blue Mountains, to the west of Sydney, are major news. This phenomenon, however, is nothing new. The extreme heat of the area, the dry conditions and penetrating winds whistling through the bush make the place very susceptible to fires in the dry season. 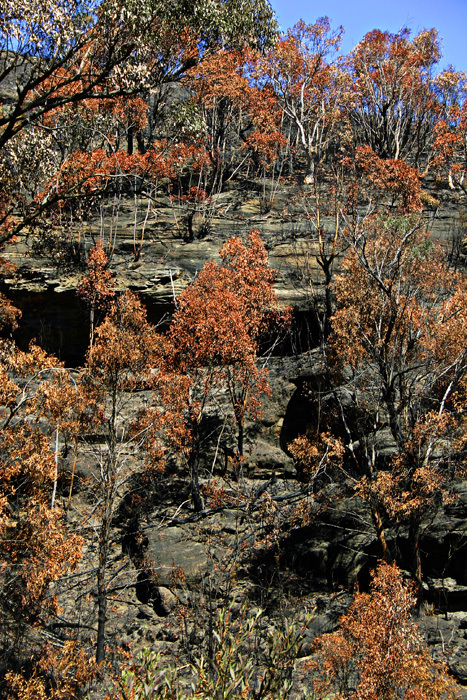 Visiting a few years ago (staying at Katoomba), I took trips into the wilderness and saw a place just beginning to recover from fire. Trees, shrubs and ground cover were all burned black or to a rusty red. A few years earlier I had been in Sydney. Views over the city ended in a murky pink-grey gloom just a few miles away, as the Blue Mountains, burning then too, sent vast quantities of smoke and soot towards the coast. One can be assured that this has been going or for much longer than man has been around. The fires, which are both horribly destructive and terrifying for the people and creatures in their way, are also purifying. The old burns and turns to dust, and new life gradually makes its way back through the ashes.